We stayed at a campsite some 10kms from Pula and it is a very large site with permanent chalets and with a naturist section. www.kampkazela.com When we were checking in the girl asked Gilroy something which we did not understand but Sheila realised that her reference to “textil” meant clothed. I think the other option was SBN – stark bollock naked. Actually the other option is FKK and I don’t know what that stands for either but can think of something ruder. This area is great for water sports and a number of the people on site have come equipped with boats, snorkelling gear and windsurfers but we settled for a sea-front pitch and quiet observation. We visited Pula and it has some interesting attractions – a Roman amphitheatre that must compete with Rome’s coliseum in size and a 1st century temple which was rebuilt in 1947 after being bombed in the second world war. Two observations so far. First, the shop assistant in the campsite had been taught at the Nigerian School of Courtesy as she threw back a 10 kuna note which was not acceptable for reasons that were never clear, and second Croatia is poor at signposting. Both something to do with the recent communist past? 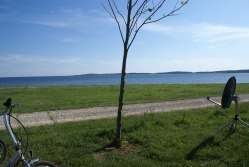 The view of the Adriatic from our pitch at Camping Kazela. We camped Autocamp Solitudo in Dubrovnik just 6km from the Old Town and a 10 Kuna bus trip. See www.camping-adriatic.com Just in case nobody told you, Dubrovnik is a VERY long way down Croatia, indeed a very long way from almost everywhere. If you fancy a trip to Dubrovnik then get a cheap flight and have a weekend there, don't drive. 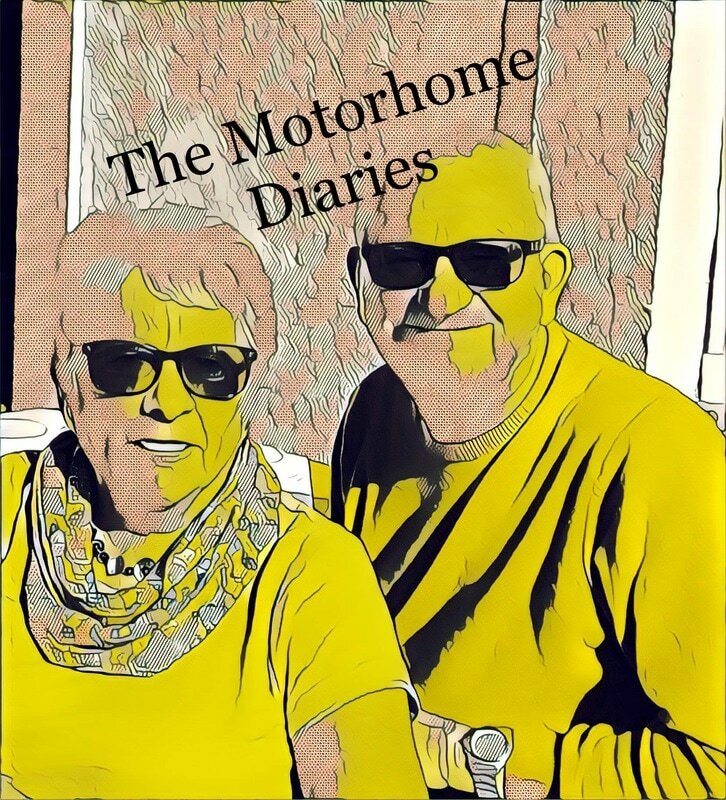 We chose the ‘interesting’ coastal route to Split which provided excellent views of the Adriatic via about 300km of Z bends, the odd hairpin bend, and a few nasty drops with little or nothing to stop you falling over the edge. And since we were slow we would be overtaken by buses on blind bends, third-world style. Fortunately Sheila did most of this driving. Funny how it often works out that way. 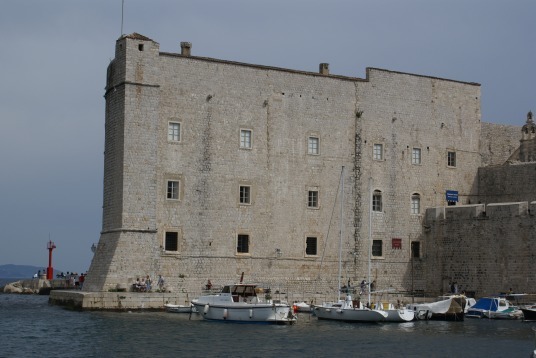 It is two full driving days from Pula on the Istrian peninsula to Dubrovnik. You could make it a little bit quicker but the road is so bendy that it gets quite tiring with all the necessary concentration. En route we were tempted to stop at ‘Camping Pinus’ but were concerned that mispronunciation would lead to difficulties. Just off the highway Sheila could see signs warning of minefields – a reminder of just how recent the war was, and an explanation for why the countryside seems very empty. What we had failed to realise until we set off for Dubrovnik was that we had to go through a little piece of Bosnia Herzegovina before getting back into Croatia, no doubt BiH needed a bit of coastline as part of the peace deal. Our camp site is good – excellent facilities in good working order, with a bus at the gate into the old town, and a beach (or as close as Croatia gets to one) a couple of hundred yards away. We went into the old town and it was chock-full of tourists, many in big noisy groups led by ladies-with-paddles shouting loudly in a multitude of tongues. Reckon most of these came from a couple of big cruise ships parked in the harbour – but these were as nothing compared with the Grand Princess which was in harbour when we arrived. It was the size of an aircraft carrier. Dubrovnik was heavily shelled during the recent war and while most has been repaired it looks as if it has been ‘restored’ a bit too much and we reckon that if English Heritage had been involved then a bit more effort would have been made with regard to replacement roof tiles as the new ones look a bit like plastic. 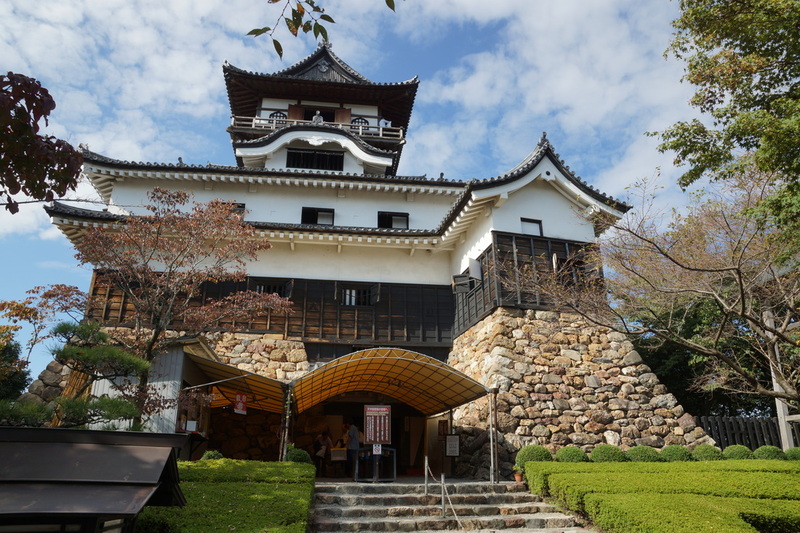 Sheila reckoned it was a bit Disney – all very pretty but doesn’t feel very authentic even when there are bits which survived both the shelling and the disastrous 1667 earthquake. 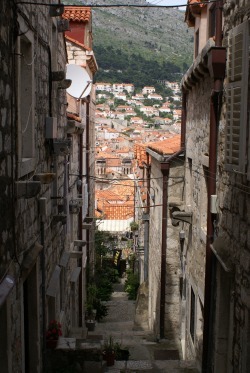 We are not sure that Dubrovnik is worth the distance. The Old Town is quite small so we walked around the main bits, and then bought 50 kuna tickets to walk around the city walls (7k to the Euro). This is quite energetic because bits of the wall go up a long way but you get excellent views. The old town viewed from a small side side street. On our way back north from Dubrovnik we stopped off at Camping Nevio near Orebic on the Peljesac Peninsula. www.nevio-camping.com This involved a turn at Ston which provided a view of it’s walls - at 5.5km ‘the longest fortification in Europe’. Amazing because it was such a small town. Camping Nevio in Orebic was a very pleasant site. Small, and seemed to be run by one family. We were in a big pitch at the top but there were smaller pitches at the bottom next to the beach. 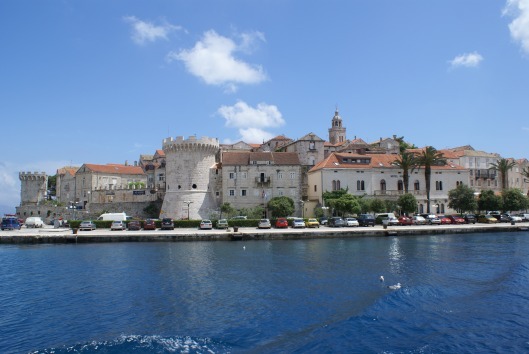 One day we got the ferry from Orebic and spent the day in Korcula (12 kuna each for a 20 minute trip). a beautiful little place, full of history (Greeks, Romans, Venetians and Marco Polo was born here) and fine buildings. A good place for a gentle half-day of wandering and some nice alleys. 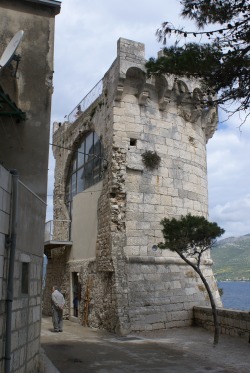 Half a tower in Korcula, there was another half down the road. 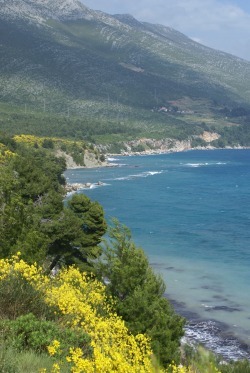 The beautiful Adriatic coast as seen from our camp site in Orebic. Scroll up to find the menu on the left hand side of this page to check out what other pages there are to read.